Unfortunately, due to sales rights restrictions, we cannot offer Iraq In Transition for sale in your country. Iraq in Transition takes the reader on a journey from Iraq's troubled history through the country's invasion and chaotic collapse of governance to the fragile state of political development today. Along the way, Peter Munson, an officer and Middle East specialist in the Marine Corps who has participated in operations in the Middle East, Afghanistan, and Africa, explains the social, cultural, and political roots of violent conflict and political confrontation among Iraq's numerous factions. 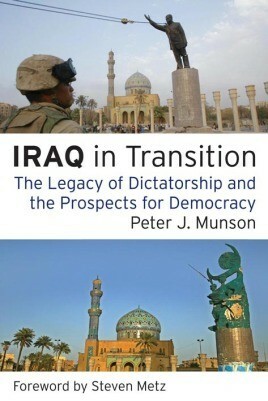 Instead of rehashing American policy and ideology, Munson addresses the local aspects of the crisis, providing a solid basis for understanding the many important decisions to come regarding the intervention in Iraq. This book fills a void in the literature by synthesizing the available information in both English and Arabic to provide a unique perspective on the people behind the violent and conflictual attempt at transition to democracy in Iraq. Utilizing both academic and military insight, Munson explains how Saddam's demise and the crisis of governance that followed produced a vacuum that allowed narrow and opportunistic sectarian power groups to step into the breach. The path from the 2003 invasion to the current tenuous Iraqi state has largely been shaped by legacies of dictatorship. Striking progress has been made in security and political development, but Iraqis still have a great deal to overcome to establish themselves on the slow climb toward a peaceful and stable democracy.